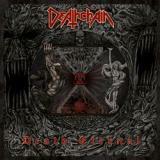 Deathchain is among the cream of a very abundant crop that can be called Finland’s death/thrash metal scene. I must right away point out that in this case the only connection this band has towards the melodic, Swedish brand of death metal is that in both cases the guitars are predominantly distorted. Otherwise, Deathchain’s approach to the mixture is extremely old school. Their first two albums, Deadmeat Disciples and Deathrash Assault were blisteringly fast, Slayer/Kreator-infused vats of metal that didn’t concern themselves with subtlety. After a vocalist-change, their third offering Cult Of Death took a turn towards darker paths, slowing things down a bit and emphasising the deathy side of the pact. The new album Death Eternal continues even further on this path, founding the entire concoction on Morbid Angel-style death metal (all the way to the raw but nicely balanced production) and sprinkling bursts of thrash here and there. The players are in fine form as guitarists Corpse and Cult churn out oodles upon oodles of riffs with deadly precision and throw in the occasional lead melodies and solos for good measure. The rhythm section handles everything from a steady bass pulse to blastbeats. Singer K.J.Khaos growls and shouts with powers and when sparsely going for very low-toned clean vocals, conjures up the feeling of MA-front man David Vincent nicely. The song material is the most varied in the band’s entire career. The batch is a strange mixture of technical tunes which still are structured in a quite simple manner. Opener Titans Of Black Earth literally blasts its way into the arena and rolls through with furious guitar work and rapid thrash beats. Sworn Beneath and Plaguethrone dominate the first half of the record (the latter is probably my favourite) with a manic tempo and catchy choruses. The Ancient And The Vile mixes some mid-tempo mayhem into quicker double bass-galloping and invokes Nile in the lead melodies. Monolith Of Death and Spheres Of Blasphemy keep the speed freaks more than entertained before the epic Incantations Of Shub-Niggurath uses some spooky woodwinds and acoustic guitars to open up for a powerful mixture of fast grinding and fist-pounding rhythmics, that end the album in grand fashion. For anyone looking for an impressive showing of thrash-infused death metal, that doesn’t concern itself too much with anything modern and bows to the old masters while banging its own head with rage, Deathchain and Death Eternal are definitely worthy targets.